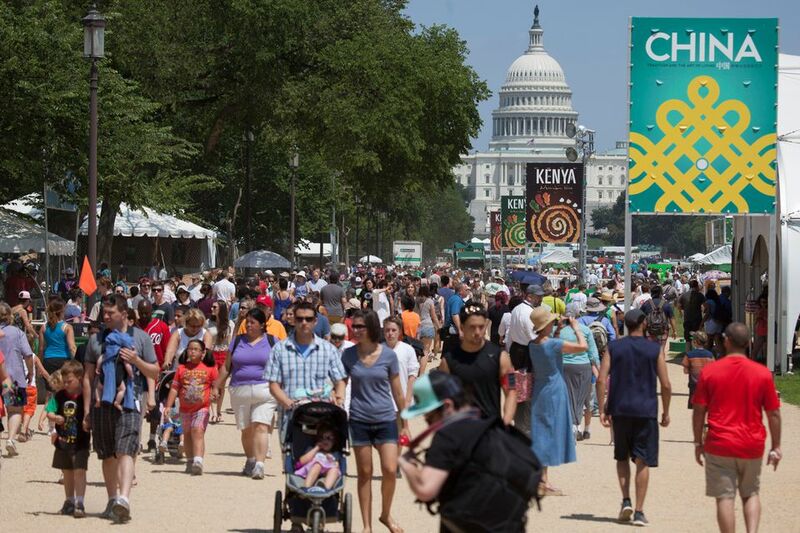 The Smithsonian Folklife Festival is a special annual event sponsored each June-July by the Center for Folklife and Cultural Heritage celebrating cultural traditions around the world. The Folklife Festival includes daily and evening music and dance performances, crafts and cooking demonstrations, storytelling and discussions of cultural issues. The 2017 programs are Circus Arts and American Folk. Performances, demonstrations and discussion sessions will highlight how cultural traditions are transformed when people and communities migrate. June 29-July 4 and July 6-9, 2017. Open daily 11 a.m.- 5 p.m. Evening events are 6:30-9 p.m. Admission is free. National Mall, between Fourth and Seven Sts. NW Washington DC. Parking around the Mall is extremely limited, so the best way to get to the festival is by Metro. The closest stations are Federal Center, L’Enfant Plaza, Archives and Smithsonian. See a map and more information about transportation and parking. This event is held during the warmest time of year in Washington, DC. Plan ahead, dress appropriately and drink lots of water. Give yourself time to visit the Smithsonian Museums to cool off. Eat lunch or dinner at the festival. The food is great and reflects the themes of the festival. If children are picky, you can easily find a hotdog from a street vendor. Seek hands-on activities to keep children involved. Be sure to check out the Marketplace where you can find merchandise produced by festival artisans and related books and CDs. Circus Arts - Aerialists, acrobats, equilibrists, object manipulators and clowns will perform. The 2017 program will bring the rich history, mystique and diversity of circus arts to life taking visitors behind the scenes to learn from generations of American circus families. Meet artists and coaches, costume designers, makeup artists, musicians, lighting and sound technicians, prop and tent designers, riggers, poster artists, wagon builders, cooks, and many others whose collective creative work brings the circus to life. American Folk - The program will tell the story of the American experience, demonstrating how “the arts can connect us with our heritage, bring us together as a community, and deepen our sense of belonging.” Artists from a wide variety of cultural groups and regions will share their music, dance, crafts, and stories through performances, demonstrations, and workshops. 2016 Festival - Basque, the Sounds of California and On the Move: Migration and Immigration Today - The Basque constitute one of the oldest communities in Europe, and today approximately 1 million people worldwide speak Basque, or Euskara, a language once on the brink of extinction and now an example of successful language revitalization. In addition to its language, the Basque Country is well known for its food, crafts, music and poetry. Sounds of California included a series of evening concerts as well as daytime performances and activities, offering a glimpse into how musical culture mirrors the movements reshaping the state and the nation today. On the Move: Migration and Immigration Today featured conversations about historical and contemporary immigration experiences and issues. 2015 Festival - Perú: Pachamama - The South American country is bordered in the north by Ecuador and Colombia, in the east by Brazil, in the southeast by Bolivia, in the south by Chile, and in the west by the Pacific Ocean. Peru is an extremely biodiverse country with habitats ranging from the plains of the Pacific coastal region in the west to the mountainous terrain in the Andes mountains to the tropical Amazon rainforest. Visitors to the Festival enjoyed a wide range of live entertainment and meet participants from 12 different Peruvian communities, including fishermen from the coastal town of Huanchaco who make reed rafts, two sisters from the Huancayo region who continue their family tradition of engraving artwork on gourds and a dance troupe from the crossroads-town of Paucartambo whose famous celebration of the Fiesta de la Virgen del Carmen draws tourists from around the world. 2014 Festival - China: Tradition and the Art of Living and Kenya: Mambo Poa! - The China program featured seasonal festival traditions, emphasize the exuberance of public life, share the meaning and preparation of Chinese foodways, engage visitors in craft and performance workshops, and highlight the country’s cultural diversity. Kenya: Mambo Poa featured more than 80 participants, including athletes, wildlife experts, archeologists and artists highlighting the East African country’s rich cultural heritage. Storytellers bring their heritage to life and encourage the audience to participate in a variety of activities. 2013 Festival - Hungarian Heritage: Roots to Revival, One World, Many Voices: Endangered Languages and Cultural Heritage, and Will to Adorn: African American Identity and the Aesthetics of Dress. Hungarian Heritage: Roots to Revival featured more than 100 participants from Hungary. Artists, dancers, craftspeople and cooks will share and celebrate the customs and traditions from every part of the country. One World, Many Voices: Endangered Languages and Cultural Heritage focused attention on the issue of global language loss by bringing together communities from around the world that are fighting to save their native tongues and cultural traditions. Will to Adorn: African American Identity and the Aesthetics of Dress is a program at the 2013 Smithsonian Folklife Festival examined the history and culture of the aesthetics of African Americans focusing on urban style centers across the United States. If you are planning to be in town for the 4th of July, read about Fourth of July Fireworks and Celebrations in the Washington, DC area. What are the Major Annual Events on the National Mall?